Preheat the oven to 450°. Spread the husks on a large baking sheet; bake for 8 to 10 minutes, until lightly browned. Reduce the oven temperature to 200°. Break the husks into small pieces. Transfer to a spice grinder in batches and grind to a powder. Sift the husk powder through a fine sieve. In a stand mixer fitted with the whisk, beat the egg whites until soft peaks form. With the mixer on, gradually beat in the sugar until medium peaks form. Add 2 1/2 tablespoons of the husk powder; beat at medium-high speed until stiff. Transfer the meringue to a pastry bag fitted with a 3/4-inch round tip. Pipe four 3-inch rounds of meringue onto a parchment paper–lined baking sheet. Bake for about 1 hour and 10 minutes, until the meringues are set and sound hollow when lightly tapped on the bottom. Let cool completely, at least 2 hours. In a skillet, combine the corn, sugar, salt and 3/4 cup of the cream and bring just to a boil. Simmer over moderate heat, stirring, until the corn is tender, 5 minutes. Transfer to a blen­der and puree until smooth. Strain the puree through a fine sieve, pressing on the solids. Let cool completely, then whisk in the mascarpone. In a bowl, beat the remaining 1/4 cup of cream until stiff. Fold into the corn mixture until no streaks remain. 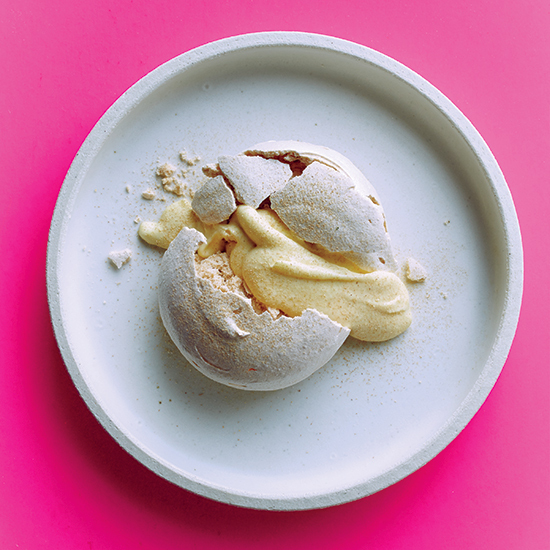 Transfer the meringues to plates and gently crack open with a table knife. Spoon the corn mousse into the meringues and sprinkle with the remaining husk powder. Serve right away. Review Body: About this recipe I like expecially the idea to use almost all of the <strong>corn</strong>'s parts: from the husks to the kernels. The final result is a dessert with great substance, great technique (not easy to make a good meringue and a tasty mousse) and an outstanding plating. Great chef de cuisine: Daniela Soto-Innes.